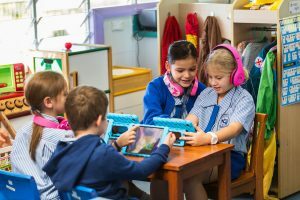 Students are immersed in 21st Century Technology with excellent Information and Communication Technology (ICT) resources including guided internet access in all classes, online educational resources, interactive whiteboards in all classrooms as well as two in the library, iPads and a computer to student ratio of almost 1:1. The mobile computer lab means laptops can be transported into classrooms, the library or outdoor learning areas with constant access to the wireless network. Students gain experience using a variety of software and communication packages and develop skills in word processing, spread sheeting and multimedia presentations. Students of St John’s School have access to the computer network for electronic mail and the Internet. Access to e-mail and the Internet enables students to explore thousands of libraries, databases, and bulletin boards while exchanging messages with Internet users throughout the world. Internet content filtering is in place to prevent students accessing material that may be illegal, defamatory, inaccurate or potentially offensive to some people. While the school’s intent is to make Internet access available to further educational goals and objectives, students may find ways to access other materials. We believe that the benefits to students from access to the Internet, in the form of information resources and opportunities for collaboration, exceed any disadvantages. But ultimately, parents and guardians of minors are responsible for setting and conveying the standards that their children should follow when using media and information sources. To that end, St Johns School supports and respects each family’s right to decide whether or not to apply for access.